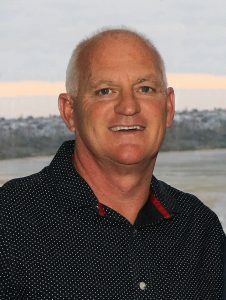 A key member of the New Zealand marine industry for over 30 years, Tony Hembrow has built a global brand that is the undisputed world leader in its field; introduced a huge number of innovations that are now industry norms; helped create meaningful boatbuilding standards and seen his company win more Boat of the Show awards than any other. In the early 1980s, Tony joined the industry, buying GRP hulls and fitting them out. Unhappy with the quality of these hulls and wanting to deliver a better product for his customers, he bought out his then partner and began building boats from scratch. Tony and his wife Vicki lived above their fledging boatbuilding factory and had more than their share of adversity, including a devastating factory fire that nearly ruined the company before it had properly got started. He also had to cope with another factory fire a few years later but, through it all, kept his focus firmly on producing the best possible boats for his customers. Combined with his natural flair for building and maintaining relationships, Tony to gradually built Rayglass into one of New Zealand’s most successful GRP trailerboat manufacturers. A keen supporter of Coastguard, Tony used his experiences in rough weather search and rescue to further improve his boats, including being one of the very first to introduce positive flotation into GRP pleasure boats. Those rough water Coastguard trips, especially one where his Rayglass 670 fell hard off a big wave, inspired him to design and build a better patrol boat, one capable of quickly getting to those in trouble and able to cope with the harshest of conditions. The new design, the Rayglass Protector, was the world’s first centre cabin hardtop inflatable. It was also a perfect patrol boat and was soon in demand by the nation’s various Coastguard fleets. When Peter Blake won the America’s Cup and began planning his 2000 defence here, Tony realised what a huge opportunity this could be. With the eyes of the boating world on Auckland, Tony had Protectors front and centre: as tenders for the various syndicates (especially Team NZ), as crowd patrol boats, ambulance boats and even private leisure boats. Before long, Police departments, military and rescue organisations, yacht race syndicates and wealthy sportsfishing enthusiasts, all over the world, were buying Protectors. In 2018, Rayglass Protectors proudly graced waterways in 27 countries and Rayglass had contributed over $370 million in export earnings to the New Zealand economy. The Protectors are also been record setters: setting both the trans-Tasman and Round New Zealand records. Selectable transom moulding to enable the same GRP hull to accommodate a variety of powerplants. As well as successfully growing his own business, Tony was a keen supporter of the marine industry and, as Chairman of the industry’s trailerboat manufacturing group, was instrumental in the creation and implementation of the Coastguard-endorsed CPC standards. Tony’s commitment to excellence, focus on putting the customer first and inventiveness has resulted in Rayglass being one of the most awarded companies at the Hutchwilco New Zealand’s Boat Show. Since the Awards in their current format were introduced in 2000, Rayglass has won 33 Boat of the Show Awards and taken out the prestigious Supreme Winner Award six times. They have also won four Stand of the Show Awards and three Innovation Awards. Tony’s innovative approach and contribution to manufacturing and exporting has also often been recognised by the wide business community. In 2000 and again in 2002, Tony won Westpac Exporter of the Year. In 2001, he was Ernst & Young’s Entrepreneur of the Year and in 2002, he was Westpac’s Manufacturer of the Year. No longer involved in the day-to-day running of Rayglass, Tony still makes an impressive contribution. Heavily involved in Rayglass’s R&D team, he was instrumental in the success their new Rayglass 3500 cruiser. A massive contributor to the New Zealand marine industry and the quality of its trailerboat and patrol boat fleets, Tony Hembrow is a very worthy inductee into the NEW ZEALAND BOAT SHOW HALL OF FAME.